This apartment is amazing. Xavi and Laura greeted us and explained where everything was and gave us some recommendations for some nice restaurants in the area. The view from the sitting room and balcony is more spectacular than the photos suggest - the sun rising and setting over the islands is beautiful. 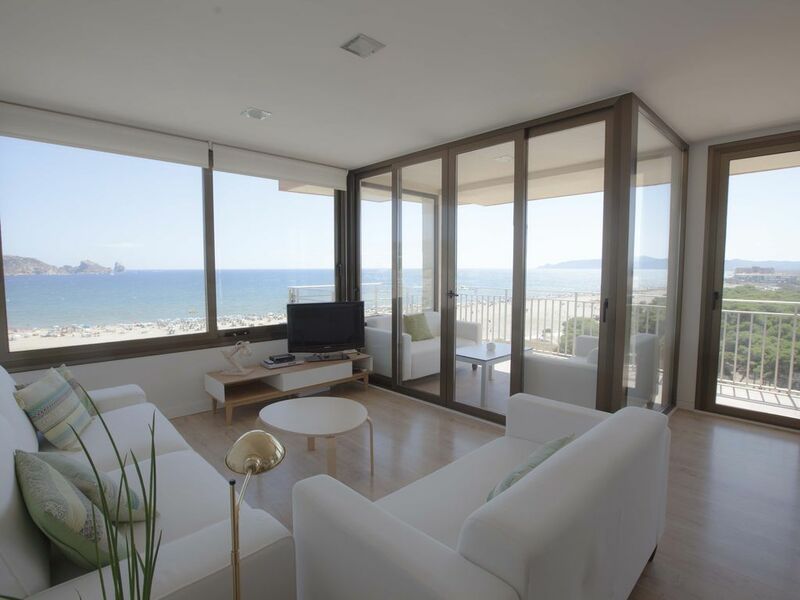 The apartment is modern and well equipped - plus perfectly placed for a stroll down the beach or into the main town. We are really pleased that you enjoyed in our apartment. You both are very kind and easygoing guest. We will be pleased if you could come at anytime. Very clean, bright and spacious appartment with everything what you need for great holiday . Kitchen was completly new and had good equipmemt . Xavier and Laura was very nice owners , they prepared us bottle of wine for invitation, they recommended us different possibilites for good restaurannts in Estartit and surroundings.. We visited Barcelona by train from Fla&#263;a. It good way because parking in Barcelona is too difficult. We also wisited Figueres - museum of Dalí, big shopping town Platja D Aro and we swimming in very clean sea in Platja St. Antonio next to Palamos. We liked night life in Estartit, there is shopping street next to the port with many restaurannts, bars and good shops . Beaches in Estartit is clean and big . We rented 2 sunbeds and umbrella every day for 15€/day . We recommended this appartment to everybody . It will be very good choice. "absolutely brilliant,great apartment location is first class, xavier and laura really nice people must been seen to appreciated thanks for a great holiday"
Sehr geschmackvoll und prima ausgestattet. Dazu wundervolle Gastgeber. Wir haben Die Zeit sehr genossen und freuen uns schon auf ein Wiedersehen. pasamos del 17 08 al 31 08 2018 15 días de sueño en el departamento de laura y xavi. todo fue perfecto el alquiler la bienvenida su disponibilidad volveremos con mucho gusto. We love to travel and have stayed in many, many rentals. This one without a doubt is the absolute BEST we have ever booked. The flat is impeccably decorated and designed and is absolutely spotlessly clean. The kitchen has everything you need to prepare any meal. The bathroom was stocked with paper, the washing machine with soap, there were cleaning supplies under the sink, new soap and sponge in the kitchen. Honestly, not a single detail overlooked. Our family of 4 (two boys ages 6&5) stayed for two weeks and we all felt right at home and were sad when it came time to leave. Location wise: the beach out front is amazing, you are walking distance to the harbor and lots of great restaurants. There are a few small markets within walking distance and a larger grocery store a quick 5 minute drive away if you needed to stock up on stuff. Xavi and Laura emailed us a list of suggestions for our stay - good restaurants to try and nearby towns to explore. We basically followed every suggestion on the list and boy oh boy nothing disappointed. Everything we saw and every meal we ate was spot on perfection. Xavi and Laura were the absolute best hosts anyone could hope for and the Costa Brava stole our hearts.. we are already talking about a return trip. Thank you X&L for everything - un abrazo muy fuerte desde California! (Text automatically translated) Wine tours by region of Empordà. Gastronomic routes.